Whoa! What an exciting contest, this New Year leaderboard 2018 has been! 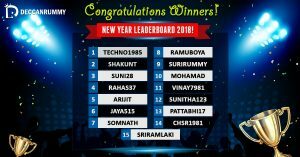 New Year Leaderboard 2018 clocked in as the biggest online rummy leaderboard contest in India. After an intense battle that lasted for over 56 days, 15 rummy game champions have proved that they are better than the best by featuring in our leaderboard. Proving your mettle against thousands of other players gunning for the top spot is no mean feat. The contest was riveting right from the moment it started and became extremely competitive with time. The contest witnessed a lot of shake-ups back and forth with respect to position in the leaderboard for some time till the dust settled. It was extremely intriguing to see who’s going to come on top. We have been vociferously promoting the tournament in social media which was one of the main reasons why a lot of new players participated. The format of this leaderboard contests was ideal for serial grinders. A lot of high-stakes grinders played day in, day out to increase their leaderboard points. It was a carnival out there and the contest was grand in every possible way we imagined. In a battle of wits, strength, and survival, 15 contestants held their nerve to hold on to their positions and they are the winners of this leaderboard contest. Many players tried to hustle into the top 3 position but not everyone was lucky. Reaching the No 1 spot in a high-profile leaderboard contest has a special feel to it. Making it to the top in a record-breaking leaderboard contest is a whole different dimension. This is exactly what Techno1985 was able to do. After 56 days of grueling action, Techno1985 emerged victorious to win the top prize. Congrats to Techno1985, Shakunt, and suni28 on winning the top 3 prizes. As promised, you guys will be taken to Pattaya, where you will get to see what Fun really means. We have also arranged to send the other prizes to the respective winners shortly. Needless to say, the trip will be an adventurous one; we are not revealing the suspense here as we feel the guests will enjoy it more if they discover it themselves. But we can guarantee that our New Year VIP Pool party will be a blast. Our team has spent the past couple of months exploring Pattaya, scouting for the best locations to take our guests to. We can guarantee that this trip will be a once-in-a-lifetime trip filled with absolute pleasure. Congratulations to every player who participated in this wonderful race! We thank each and every one of you wholeheartedly from the bottom of our hearts for your passionate and honest gameplay. There was no instance of foul-play in this whole contest. While we understand not everyone is lucky enough to feature on the leaderboard but what really matters in a contest like this is your passion towards the game. And we have seen it in ample amounts. All we can say is keep trying; your moment of glory is not too far away. What an incredible year this 2017 has been. From Special tournaments to Phuket trip to endless bonus offers to Pattaya trip, this year has been a year to remember. One thing is certain – no one can say that 2017 was not a memorable one! We have vowed to make 2018 a great year for all the Indian Rummy enthusiasts. Come 2018, there will be lots of offers and promotions on a regular basis. We are gladly looking forward to seeing each and every one of you excel in another exciting contest of ours. Have an amazing holiday season! Se you soon with another exciting contest! Play Rummy & Watch Salman Khan’s Tiger Zinda Hai Free!